Famous chefs and foodies alike know something the average household cook may not — they’re in tune to that spark, that perfect balance of flavors that makes a dish come alive. That spark, or secret if you will, is none other than vinegar. So what exactly is vinegar? It gets its name from the French word vin aigre, meaning sour wine, which is an explanation of the original process. Wine becomes sour and turns to vinegar. So, vinegar is just a sour liquid made from the fermentation of sugar to alcohol and alcohol to vinegar. Just a splash of vinegar adds a punch of flavor to almost any dish. And you can tailor that punch by using flavored vinegar. Herbs and white wine vinegar are perfect flavor companions, and is a great way to use those extra herbs from your garden! 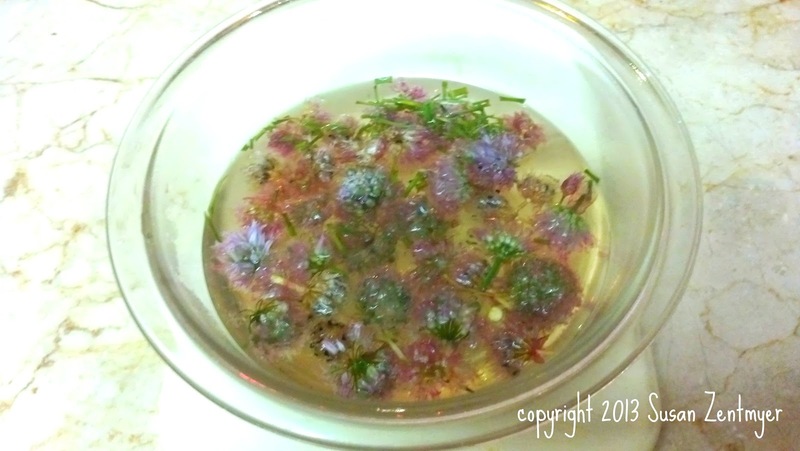 I've made Chive Blossom Vinegar here to show you just how easy it is to make. 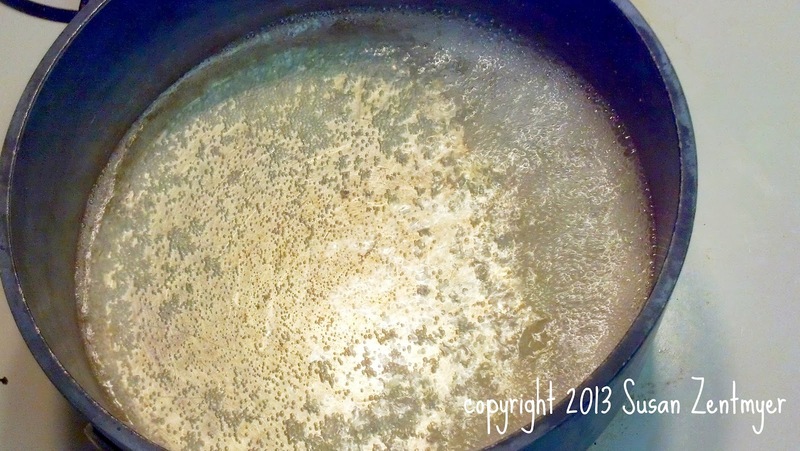 Heat the vinegar in a small saucepan over low heat until hot. Meanwhile, rinse the chive blossoms in a bowl of cold water, drain and shake off any excess water. Return the blossoms to the bowl. 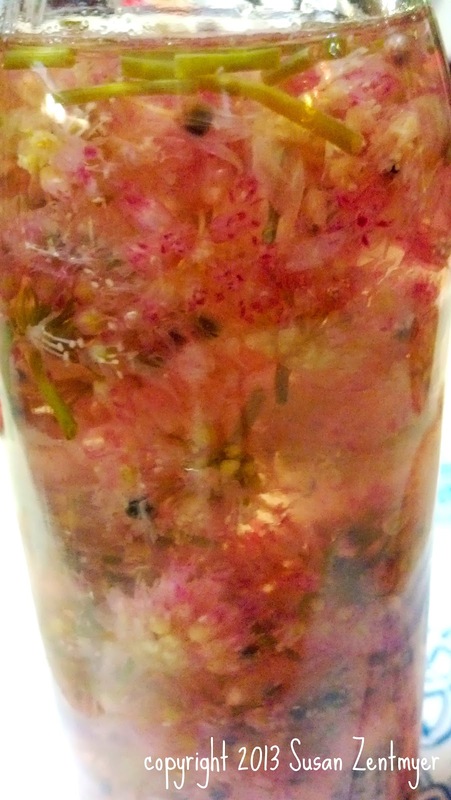 Pour enough of the warm vinegar into the bowl, submerging the blossoms. You can use a metal spoon to push down any errant blooms that want to float up over the top. 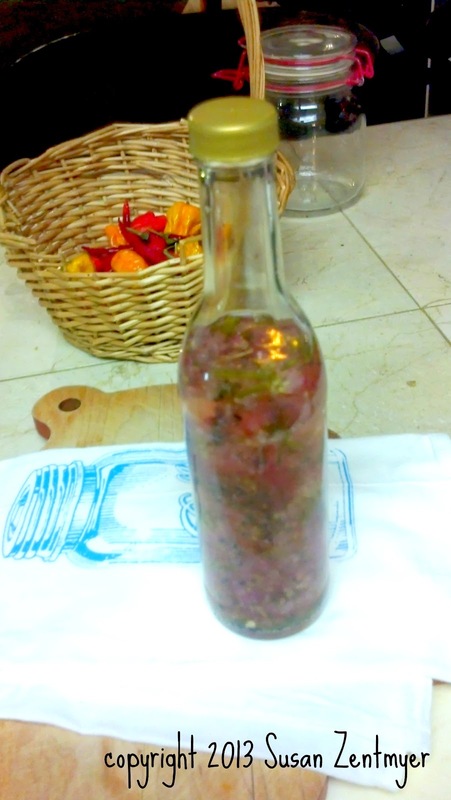 Let the vinegar cool, then pour into a bottle (I use the same bottle that the white wine vinegar came it for this). Stuff any chive blossoms that don't pour, into the bottle. Put the top on the jar and close tightly. Place the container in a dark, cool spot. This infusion benefits from at least 1 to 2 weeks of steeping. When you’re happy with the strength of the vinegar, strain it through a fine sieve and toss the spent blossoms. Pour the vinegar into your favorite glass sterilized bottle with a rubber stopper (or reuse the same bottle). This has such a lovely light purple color and onion-y, chive-y tartness - you'll love it in salad, but use it to boost the flavor of your spaghetti sauce or sprinkle over your french fries or baked potato. Any way you use it, you'll be happy you made it!